Kate Middleton dazzled in a sleek updo while at a Bollywood-inspired charity gala at the Taj Mahal Palace Hotel in Mumbai, India, on Sunday, April 10. The Duchess of Cambridge, 34, didn’t have a hair out of place for the formal affair, opting to have her tresses swept up in a low style, which was wrapped into an elegant chignon. 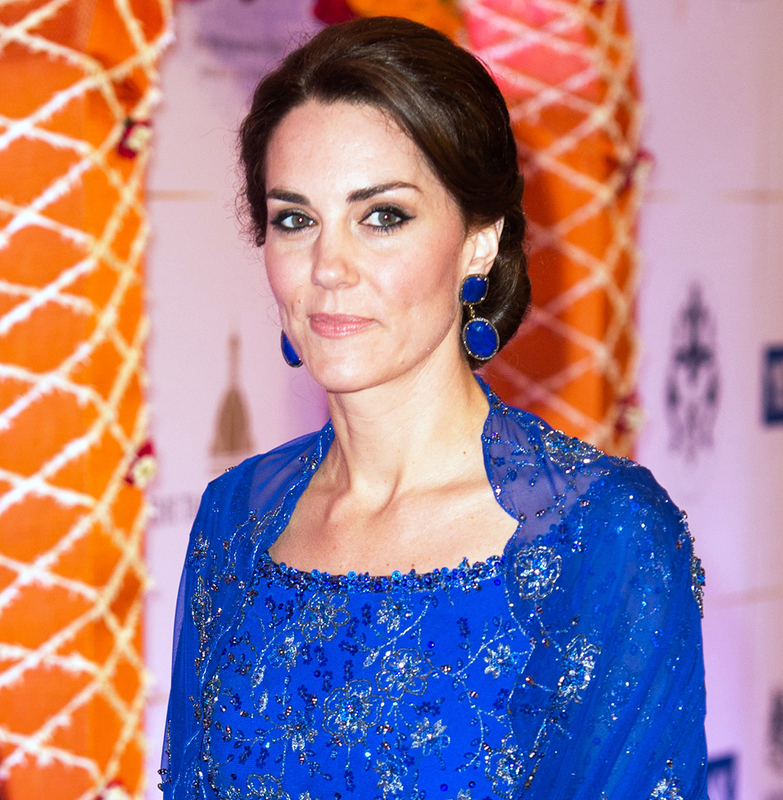 Middleton was a vision in blue at the event, which was part of her and husband Prince William’s tour of India and Bhutan. She wore a cobalt-colored, embellished Jenny Packham gown with a matching shawl — both beaded in India — and statement earrings by Indian jeweler Amrapali as she and the Duke of Cambridge mingled. The guest list included Bollywood actors Shah Rukh Khan, Slumdog Millionaire star Anil Kapoor, Aishwarya Rai, Aamir Khan, Rishi Kapoor and film director Farhan Akhtar. "This was the first time I&apos;d met them," Khan, 50, told Us Weekly of the Duke and Duchess. "Is it OK to say she&apos;s extremely beautiful and elegant? Well she is!" During the formal reception and dinner hosted by the British High Commission in partnership with the British Asian Trust, attendees raised funds for three charities: Magic Bus, the Door Step School and Childline. "[Middleton] said she loves being here and the people are very welcoming," actress Madhuri Dixit told Us after she shook the couples&apos; hands. "But she was worried she may miss her children." The gala topped off a day full of activities, from challenging one of the world’s best cricket players, Sachin Tendulkar, to visiting the Door Step School and playing football with kids in one of Mumbai’s poorest slums. Tell Us: What do you think of Kate&apos;s updo?